Alpha waves, or the Alpha state are a type of brainwave oscillation commonly associated with a relaxed state of mind. Robert Monroe mentions Alpha waves a lot in regards to a relaxed state, as well as when he touches on Hemi-Sync. The alpha state is important to astral projection; it is the first state your mind should be in before one is attempted. How do I get into an alpha state? Simple! Check out the Preparation article over at techniques. 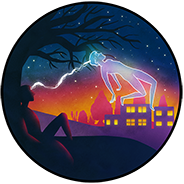 These are designed to get you into an alpha state of mind, which you can then progress to an astral projection, through a technique of your choosing.